There are two types of people in Germany right now: refugees and people talking about refugees. Recently a friend of mine was telling a group of us about his volunteer work in a Berlin refugee home. He said that Berliners have volunteered more than enough clothes, foodstuff, and other material goods to meet the need, though a better logistical infrastructure is still needed to process and distribute all the relief. “So is there a big kitchen tent where everybody eats lunch together?” another friend wanted to know. No, no, the refugees are able to cook for themselves, was the answer; they’re really selbstständig. That word is usually reserved for kids who are old enough to look after themselves. The subtext of his story was one of surprise, but why the surprise? These refugees traveled across the Mediterranean and then across Europe to get to where they are. Of course they are able to look after themselves. German media, in other words, are doing a great job of “humanizing” the refugees’ hosts. And yet why do I mock another’s description of an altruistic deed I have not bothered performing? Which form of smugness is more self-serving and churlish? In truth, I am torn, and I hate to admit it. It’s hard not to be impressed by the outpouring of generosity and genuine kindness from so many Germans for the refugees in a time of need. At the same time, I am equally appalled when Germans exploit these moments of crisis to collectively plop down on the therapy couch to ponder that eternal question of how “we”—that famously impermeable German “we”—are doing. You know, as a people. You know, that people. This German mindset being evaluated refers to a set of codes and experiences that seem broad at first look, but reveal themselves as poisonously narrow when applied to the demographic reality. To belong to this “we,” you must be German, meaning that you have German ancestry. You probably have some Wehrmacht soldiers in your family and feel guilty about that, yet you’re confident that you personally have come to terms with that part of history. You’re not poor and neither were your parents when you grew up. You are not a Jew (as I am) and you don’t have a migrant background, at least not beyond ancestors who may have come in from Silesia. So this is the “we” that often has an “Are we doing ok?” reckoning with itself. For a time, the answer looked to be “no,” such as this past summer when refugee homes were burning and neo-Nazi violence, well organized in groups and movements like Pegida, spread across mostly the eastern part of the country, in an ugly echo of neo-Nazi incidents that were quite common in the early 1990s. It was around that time last summer that Der Spiegel came out with a flip cover: One showed smiling refugee children playing with balloons at a kids’ party, the other a refugees’ quarters burning. A Spiegel editor once told me that the subtext of the magazine has always been “What does X mean for Germany?”, but this time there was nothing subtle about it, reducing the question of German identity to a binary choice. “Light Germany–Dark Germany: It’s up to us to decide how we want to live,” the magazine’s headline read. For anyone still not understanding the test before the German people, many refugees arrived packed in trains hurried out of Hungary and Vienna. The resonances, whether appropriate factually or morally, seemed as inescapable as suppressed guilt: the Holocaust. Much has been made of Germany confronting its past. I’ve never experienced this Vergangenheitsbewältigung as anything other than yet another opportunity for German self-obsession. The politics of memory point towards a commemoration of a loss of culture, a loss of innocence—not necessarily the loss of the lives of 6 million Jews that were gassed, shot, and starved. German atonement is admirable except for its lack of intimate empathy, and I worry that may yet prove to be the missing ingredient in this refugee crisis. Still, in answer to Der Spiegel’s question of which Germany we are going to be, “Light Germany” has mobilized impressively. Germans have pitched in, donating diapers, phones, and their old clothes, but also their time, which, all things considered, is more precious to them. In the absence of so many volunteers, we’d have a humanitarian crisis on our hands. The government was overwhelmed early on, which is a worrisome truth lost in all the self-congratulation. I do worry about what comes next. The conservative Bavarian party CSU, affiliated with Chancellor Angela Merkel’s Christian Democrats, have indulged in fear-mongering, with some of its top officials calling for changes to the nation’s laws to make it harder to gain asylum. Meanwhile there are more reports of ethnic strife in the refugee homes themselves—among them the one in Hesepe, where Der Spiegel‘s balloon picture was taken. Apparently “being Muslim” isn’t the great equalizer the popular (and populist) German imagination hoped it would be. From volunteer and journalist friends, I hear that conditions even in the “flagship” camps deteriorate. There is no end in sight; as many as 1.5 million refugees could come in total. And the summer is over, meaning it will get colder for refugees and more difficult for volunteers to take time off from work or school. The fact that the fate of refugees has been left as much to ordinary people as it has been to the state is a fitting validation for my generation’s disenchantment with the government and the political process. Maybe this is a hopeful sign: Maybe we will now demand more of government in return. Alternatively, being so impressed with their generosity, Germans might demand too much in return of refugees. Maybe the German “we” will start roaring again, start feeling resentful, bemoan a lack of gratitude. Maybe. 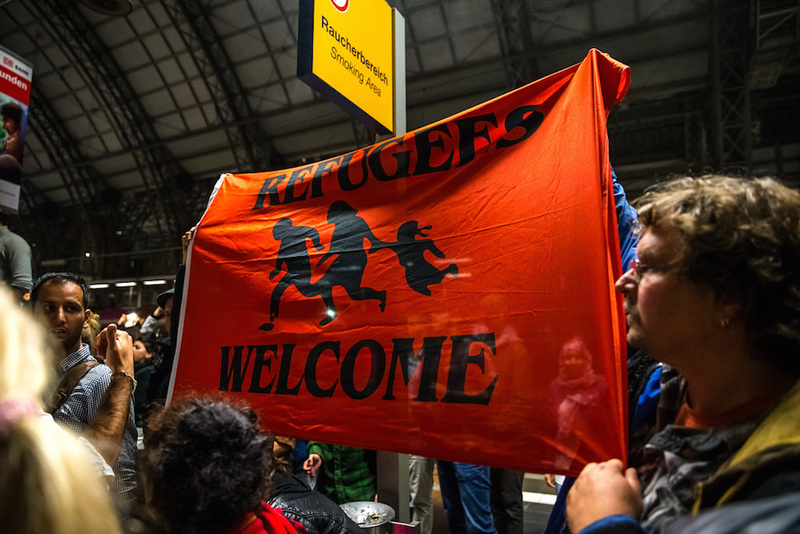 Either way, all of this will continue to be only secondarily about the refugees—and more about Germans’ reaction to them. Fabian Wolff is a writer in Berlin who contributes regularly to a number of German and English-language publications and is now working on his first novel, about extremist violence in Germany.